However, this is very rare and the RAD is mostly a paper based process. The RAD gives refugee claimants a chance to argue that the RPD made errors in fact or law or both. Unlike in a judicial review, in a RAD application, you may also submit new evidence for the appeal if you can show that this evidence only arose after the rejection of your claim or that it was not reasonably available to be presented before the RPD. Claimants with decisions on PRRA applications. 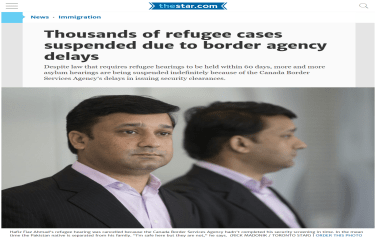 Refugee claimants without access to the RAD may still apply to the Federal Court of Canada for permission for a judicial review of their refugee claim. You have 15 days from the date you receive the negative RPD decision to file an appeal to the RAD. You have a further 15 days to submit arguments and documents for the appeal. The RAD can substitute its own decision in place of the RPD decision or it may send the claim back to the RPD for a new hearing. It can also reject the appeal and find that the RPD’s decision did not have any errors in fact or law. A RAD decision can be appealed to the Federal Court for judicial review by either party. Typically, RAD appeals are decided by a single member. In some cases, the IRB chairperson may direct that an appeal be decided by a three-member panel. Decisions by a three member panel will be binding on the RPD and for RAD single member panels. Except in the rare cases where a hearing is required, the proposed time line for a RAD decision is 90 days from when the appeal is submitted.